Our new L-39 Albatros was first test flown on the Kyosho power plant that is used for their T-33. Our L-39 very closely matched the performance of the T-33 using the same power plant. When we put the brushless 05-3 turn from Astro Flight in our new L-39 it changed everything. Our L-39 now matches the perfomance of the T-33 at two thirds throttle leaving the rest, well were let you choose how to use the rest of that power. As for overall performance of our new L-39 it is very stable in flight and easy to handle. It can perform aerobatic manuevers with either power plants but is much more fun with the 05 motor. In any case we know you will enjoy our new L-39 Albatros. "L-39 Updates: There has been alot of talk about our L-39 on the net lately and we thought we would update you on some things we have worked out on our end with this kit. The best fan for this plane is the WeMoTek mini 480 fan. The reason is because the tailcone on the plane can only be opened to 2 3/8" in diameter. The WeMoTec fans ID is 2 3/4". This gives you a better ratio over the Kyosho fan. We are now flying our L-39 using a WeMoTec mini 480 fan with the new Astro Flight 05-3 turn motor on 10 1250 cells. We are getting speeds of around 70 mph and flight times of 4 minutes at full throttle. Our next move will be to disable the BEC and move to a 12 cell count. 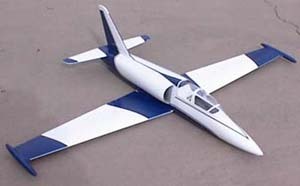 With the scale 37" span wing we should be able to get up around the 80 to 85 mph range.